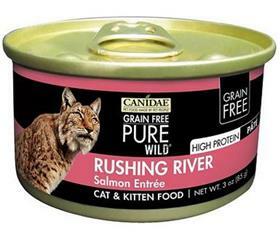 Unleash your favorite feline’s passion for the meaty flavor she craves with CANIDAE Grain-Free PURE WILD Rushing River with Salmon Canned Cat Food. This premium, high-protein meal features real salmon as the very first ingredient, along with chicken and chicken liver, to provide the energy and nutrition your active cat needs to thrive. Thanks to the grain-free recipe of this delicious food, it’s easy for her to digest and ideal for the cat with allergies or food sensitivities. The creamy pate delivers a smooth texture and savory flavor your four-legged friend will go wild for. Ingredients:Salmon, Chicken, Chicken Liver, Fish Broth, Natural Flavors, Agar-Agar, Calcium Carbonate, Choline Chloride, Potassium Chloride, Tricalcium Phosphate, Salt, Taurine, Iron Proteinate, Zinc Proteinate, Niacin, Vitamin E Supplement, Manganese Proteinate, Copper Proteinate, Sodium Selenite, Thiamine Mononitrate, Vitamin A Supplement, Biotin, Calcium Pantothenate, Pyridoxine Hydrochloride, Riboflavin Supplement, Vitamin B12 Supplement, Ethylenediamine Dihydroiodide, Vitamin D3 Supplement, Folic Acid, Menadione Sodium Bisulfite Complex.